Spring Clean with Whey Thins! Snacking is always an exciting part of the day, even more so on a Cleanse Day! The problem, however, is most goodies are loaded with salt, sugar, high in calories and contain a crazy amount of preservatives. Luckily Isagenix® has your back with a range of snacks that help you power through your spring cleanse. There’s more variety than ever with the new Whey Thins™ Tomato & Basil exclusive for Aussies and Kiwis. Why are these delicious and convenient treats so crucial for your Cleanse Day regime? It’s so simple yet genius! Each serving packs a protein punch to leave you feeling full and completely satisfied during your Cleanse or Shake Day to help you resist those nasty temptations that always seem to follow you on your day of fasting. The individually packed 100 calorie snack provides all the valuable nutrition you need to complete your spring cleanse and trim those unwanted kilos successfully. 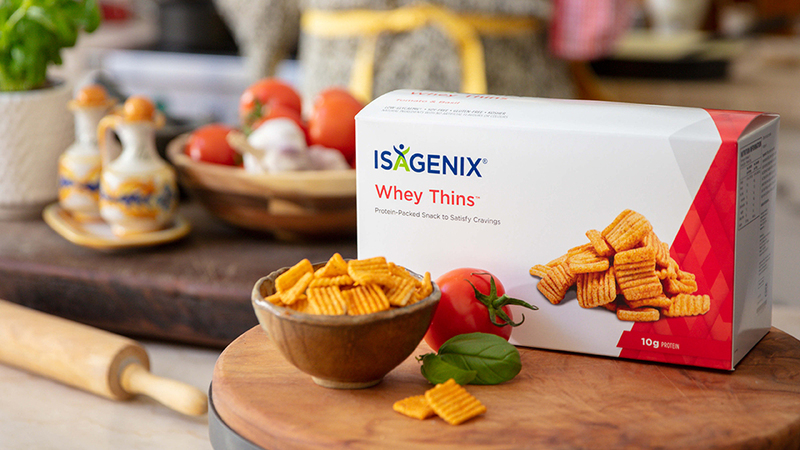 Yes, you heard correctly, Whey Thins are just 100 calories per serve. As tempting as it sounds, it doesn’t mean you breeze through four packets in one sitting. One pack of Whey Thins Tomato & Basil is essential to your spring cleanse by providing just the right amount of carbohydrates and nutrition throughout the day to fuel your metabolism and ensure that your body is not disrupted during its cleanse. Make the most of your spring cleaning by adding Whey Thins Tomato & Basil to your next order in the Back Office on the IsaLife™ App!